Theme: Up in the air. I took this first photo quite a bit ago, and these houses are pretty much done now. I just never got around to finding an appropriate time to publishing it. This was taken from the second-floor level, although it seemed much higher because I had to climb two ladders from the basement level to get up there. © 2011 by The York Dispatch. Lavern Martin and Eric Martin, both PsL Construction employees from Ephrata, help raise the wall of what will be a three-story townhouse's second story (not including the basement) in the 900 block of North George Street on Tuesday, Feb. 15, 2011. 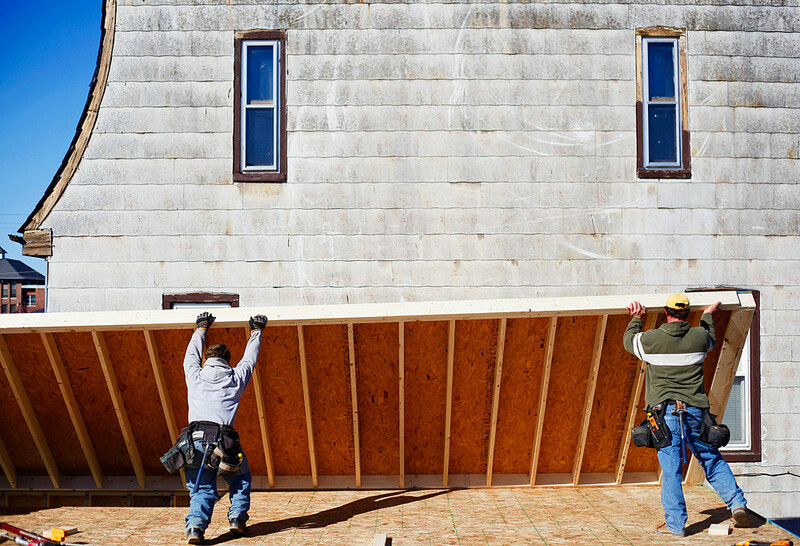 Construction crews are working on six, three-story townhouses on the 900 block of North George Street, where a June 8 fire destroyed $1 million worth of property and mixed-use buildings. These next two “up in the air” photos were taken much more recently. © 2011 by The York Dispatch. 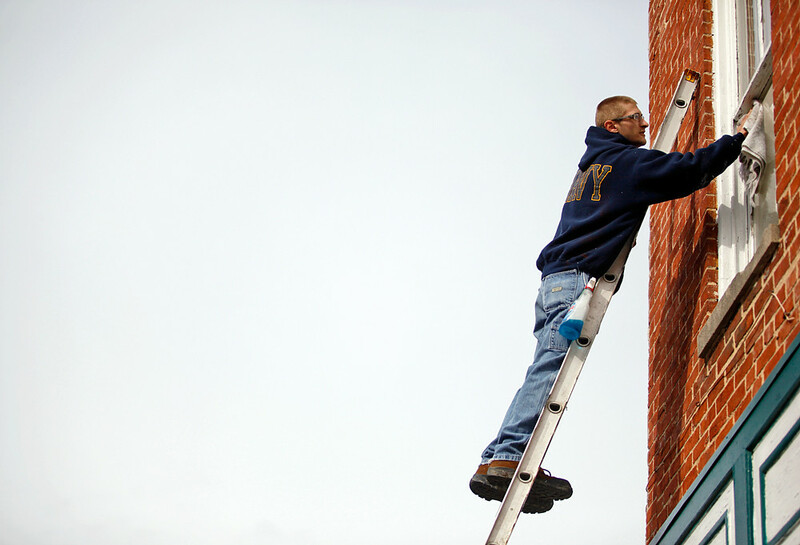 Tanner Myers scrapes paint off and cleans his second-story windows in the 200 block of W. Market Street on Wednesday, March 30, 2011. Myers' window frames were painted about a month ago on a windy day, so the paint splattered all over the glass. © 2011 by The York Dispatch. 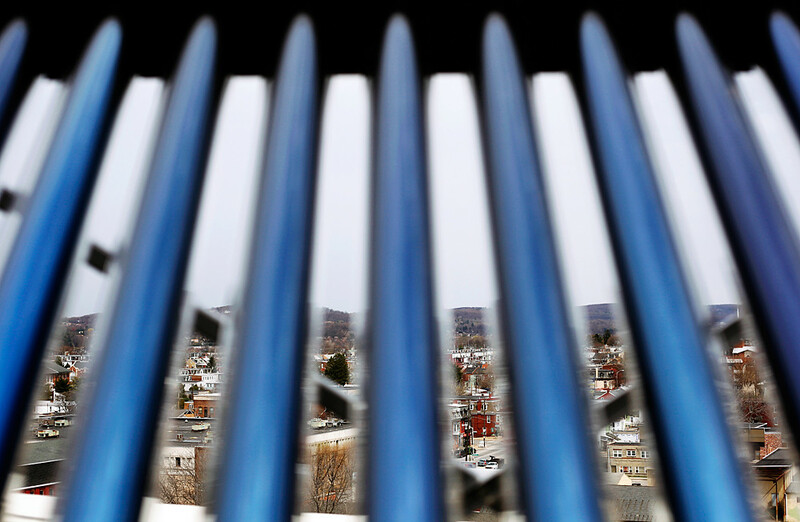 This solar thermal unit is one of several installed on the roof of a York Housing Authority single-room occupancy building. The tubes are filled with propylene glycol, which doesn't freeze and which will be heated by the sun, pumped through the system and help heat the building's water. Thanks to a $2 million competitive, energy-specific American Recovery and Reinvestment Act fund, the Housing Authority of the City of York has installed photovoltaic/solar panels and solar thermal units to service one of its single-occupancy buildings on 449 East King Street.